The unique Kalsi Seal design provides hydrodynamic seal lubrication even under high differential pressure. This reduces seal friction, and provides long life. 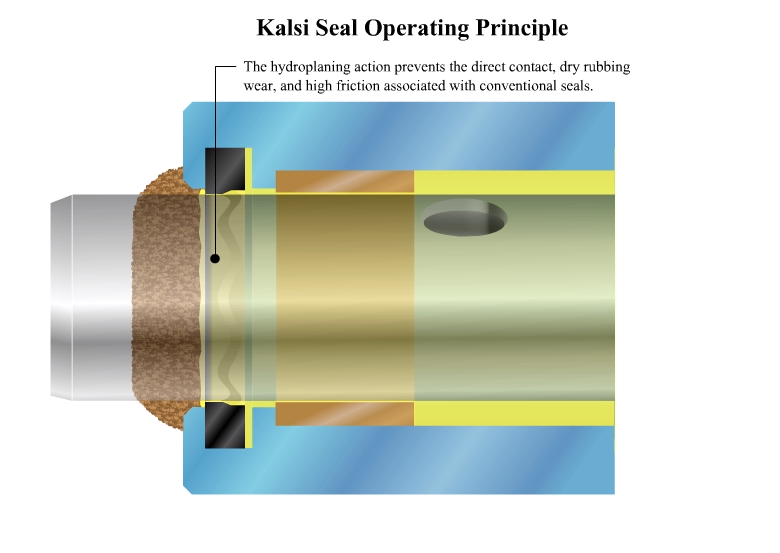 Kalsi Seals® are a family of patented, one-piece rotary seals that provide hydrodynamic lubrication to minimize seal and shaft wear, and to accommodate high differential pressure. They are used for lubricant retention and contaminant exclusion. They were originally developed for the harsh and unforgiving oilfield downhole drilling environment, and provide an effective solution to the severe service conditions found in many different industries. How Kalsi Seals Work… Kalsi Seals are installed in a housing groove and compressed against a shaft, and seal statically in the same manner as other interference-type seals, such as O-rings. 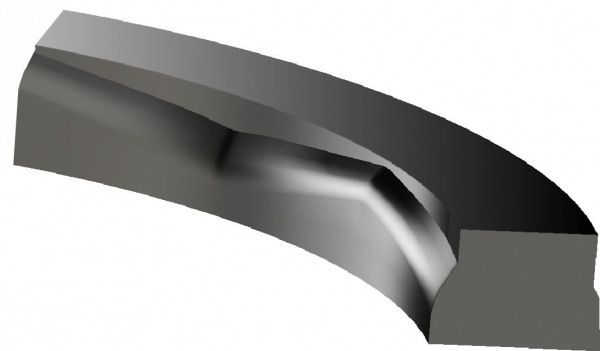 The dynamic sealing lip incorporates a wavy hydrodynamic edge on the lubricant side, and an abrupt circular exclusionary edge on the environment side. 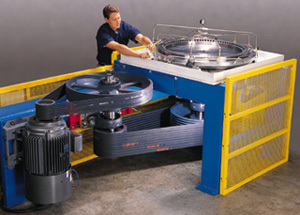 When rotation occurs, a thin lubricant film is hydrodynamically wedged into the dynamic sealing interface by the waves. This hydroplaning effect lubricates the seal and shaft, preventing the typical dry rubbing wear, high running friction and heat associated with conventional seals, allowing higher pressure and speed combinations and providing long life. When rotation stops, the hydrodynamic lubricating action stops, and static sealing is reestablished. Click here for a slow motion animation of seal lubrication. Hydrodynamic lubrication reduces seal and shaft wear, running torque, and seal-generated heat, and permits higher pressure and speed combinations. Lip design excludes environmental abrasives. Suitable for transient conditions that cause mechanical face seals to fail or leak excessively, such as frequent starts/stops, pressure fluctuations, shock and vibration, and temperature changes. Compact, one-piece seal design is installed in a simple O-ring type groove. Kalsi Seals are available directly from Kalsi Engineering in an assortment of styles, cross-sectional sizes, and materials to address various operating parameters. For detailed information about using Kalsi Seals in your rotary shaft seal assembly, visit our literature page. Seals are stocked in diameters ranging from 0.394″ (10 mm) to 17.500″ (444.5 mm). Custom diameters and cross-sectional sizes can also be provided if desired. Kalsi Engineering, Inc. was established in 1978 to provide mechanical consulting engineering services, and is recognized worldwide for technical excellence. The founder of the company, Dr. M.S. Kalsi, was the manager of R&D for an oilfield equipment manufacturer prior to starting Kalsi Engineering. He first became interested in elastohydrodynamic lubrication while pursuing his graduate degrees, and his fundamental research led to the basic Kalsi Seal design. Since then, the company’s application experience and continued commitment to hydrodynamic seal research have resulted in many innovations that continue to enhance rotary performance and expand our product line. The engineering support team provides technical review and input for rotary seal implementations. 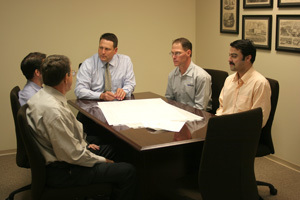 The team has 115 years of combined experience in rotary seals and oilfield equipment. During initial seal development, lubricant film thicknesses were predicted by specially developed elastohydrodynamic lubrication software. Film thickness predictions and rotary performance have been verified by optical interferometry studies, and by years of testing and commercial use. Detailed technical information, including installation dimensions, is provided in the Kalsi Seals Handbook, available on the literature page. Experienced Kalsi Engineering personnel are also available to provide technical support. If you would like Kalsi Engineering to review your rotary seal application, please download an application questionnaire in PDF or Word format, and e-mail or fax to us at 281-240-0255. Alternately, you can e-mail us with your rotary sealing questions, or call us directly at 281-240-6500. 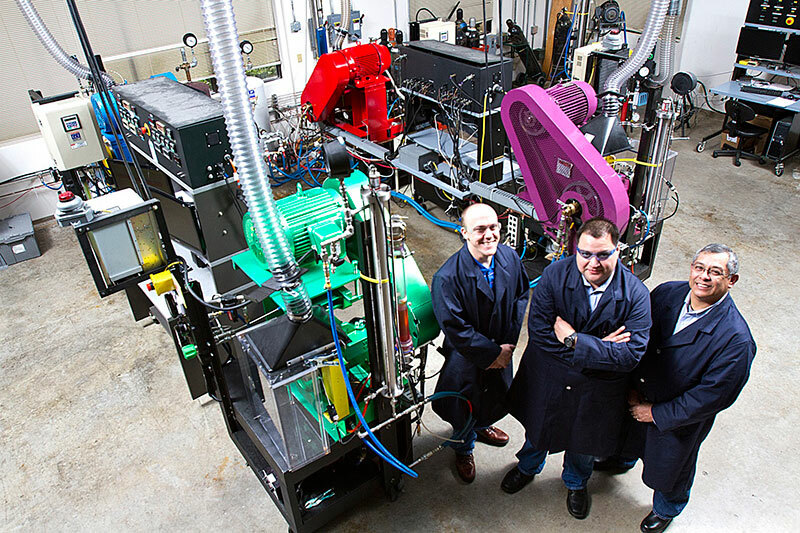 Computer-controlled rotary test fixtures are available to evaluate seal performance with customer-specified lubricants, process fluids, temperatures and other application-specific conditions. Comprehensive engineering services are also available. Rotary seal test fixtures are available to test customer-specified conditions. Here a test is being set up for a custom 42″ high pressure seal. Kalsi Engineering’s research and development mission is continual product improvement directed at the needs of new and existing rotary seal markets. Products are developed and refined using state-of-the-art analysis techniques and rigorous testing. The performance of existing rotary seal products is also continually being evaluated in our well-equipped laboratory. Customers are invited to visit our facilities, to discuss the latest technology. Kalsi Engineering uses dispersed manufacturing techniques for the manufacture of all Kalsi-brand rotary shaft seals. These techniques help us to reduce supply chain risks and disruptions. Incoming products are thoroughly inspected in compliance with our quality management system, packaged and labeled in a traceable manner, and stored under proper conditions. We use rigorous forecasting techniques to maintain adequate inventory levels. We store our rotary shaft seal inventory at three separate locations. This dispersion of inventory allows us to continue to ship product in the event of a disruption, such as a natural disaster. Kalsi Seals are offered for sale under the terms and conditions of the “Offer of Sale” that is included in the current revision of the Kalsi Seals Handbook.